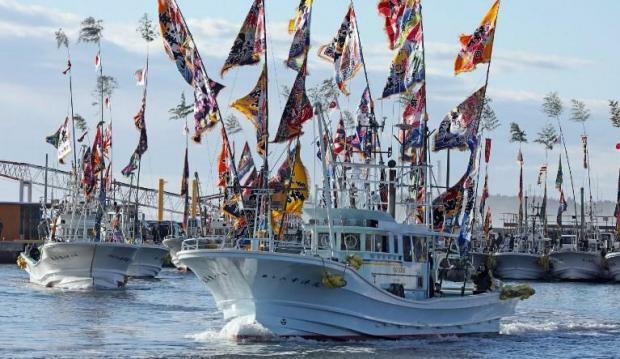 Fishing boats attend a ceremony to start the New Year at Ukedo fishing port in Namie Town, Fukushima prefecture. Japan said Friday it would have to amend its upcoming budget to fund compensation for people whose benefits were underpaid for years because of a scandal involving erroneous labour data. "I have received a report from the labour and welfare ministry that they need to provide employment insurance and other payments retroactively," top government spokesman Yoshihide Suga told reporters. "We will make adjustments to make a necessary budget allocation in the fiscal 2019 budget" for the year starting in April, he said. The ministry nevertheless went ahead and published data on December 21 and January 9 that it knew had sampling problems, raising questions about the reliability of official statistics in the world's third-biggest economy. Suga said it was "extremely regrettable" that confidence in the survey was shaken. Labour Minister Takumi Nemoto voiced "sincere apologies for causing trouble to the people."